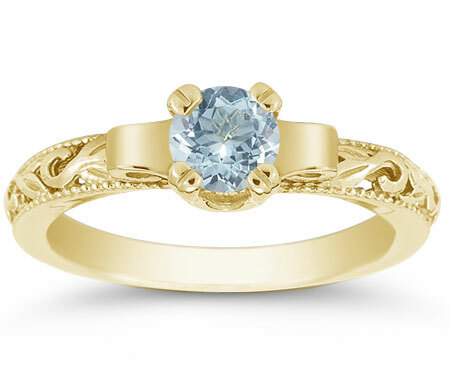 Apples of Gold Jewelry brings your favorite gemstone to life with this beautiful art deco period aquamarine engagement ring in 14K yellow gold! The icy blue of the authentic A rated aquamarine stone adds sparkle to the ring, which features a sophisticated design along the band itself. This design, which gives the ring an extra bit of personality, looks amazing when coupled with the gemstone. This ring is sure to make a wonderful impression, and is perfect for wear anytime! We guarantee our Art Deco Period Aquamarine Engagament Ring, 14K Yellow Gold to be high quality, authentic jewelry, as described above.